This unique resource provides valuable assistance to those writing and publishing nursing research. Rather than emphasizing how to conduct research, this reference assists in the writing task itself — identifying the principles of writing and the commonly used methodologies of health care research. 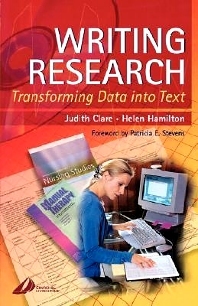 The writing process, as it applies to research, is examined and techniques for writing are discussed in detail. Practical hints and helpful suggestions are included throughout the text, with examples where appropriate. In addition, the book discusses the similarities and differences between the forms of written research — specifically journal articles, theses, conference papers, and research reports. The theory and practice of research writing are comprehensively covered. Information on how to arrange material for specific purposes is provided. A range of commonly used research approaches is encompassed, and the writing task is discussed from within each. The writing process is linked to a philosophical basis of the research approach.